Places to see in Sri Badam: The nearby Phuntsok Choeling Monastery famous for its meditation center all over Sikkim and its neighboring state as well as in countries like Nepal and Bhutan. The monastery is also well known for healing people from any kind of sickness which is cured by religious ritual and practices. 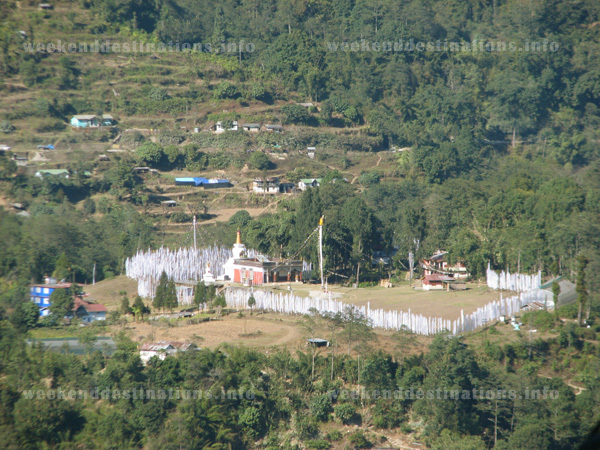 The Nyingmapa Palyul Dechen Gawelling Monastery known for its famous Phurpa Tordo Puja and Cham Dance (Mask Dance) that is performed during the month of December every year. There are three natural lakes and one artificial lake at Sribadam. Lakes like Bhaishi Pokhori, Jhor pokhori are well known. Bhaishi Pokhori is in a sacred location in the forest of Sri Badam. The Bhaishi Pokhri has numerous amount of fishes and is forbidden from fishing. There is a road built by the British for their horses in the middle of Sribadam forest and Ganesh Tok. You can also visit the Woodwork Industry where designs are carved on the wood plank and tables known as Thockchi, Holy seat for Rimpoches [ABOOT] are made. If you are adventure loving then trekking around the Wildlife Sanctuary at Sribadam will be a different experience. There are two waterfalls near Sri Badam. The Ramay Dham dara known for its varieties of flowers and is a place where Rishi (sadhus) perform pujas of various kinds. The famous 10 Buddhist praying wheel that is powered by water current is also nearby. The temple of Om Nandha (God Angel) is also famous for its meditation center. The unique 17 stairs leading to Jhandi Dara in the middle of Sribadam forest which was built during the British period is also a place to visit when you are at Sribadam. Nearby attraction of Sribadam: You can visit the Rishum monastery, which is around 20 minutes by car from Sri Badam. 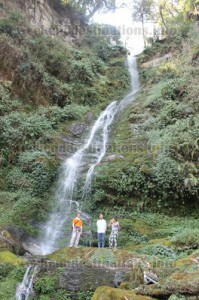 A trek route leads to the famous Varsey Rhododendron Sanctuary. You can visit the hot spring at Legship and also the famous Daramdin Sai Temple. From Sribadam you can visit Solophok and Samdputse at Namchi. 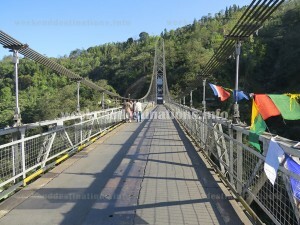 The Singshore Bridge at Uttarey and even Khecheopalri Lake can be visited during a half day sightseeing. The Shrijanga Temple is just 13 kms from Sribadam. The Vhir Dara Tourist Point, well known for great views of Mount Kanchenjuga and sunrise can be visited from Sri Badam easily. You can even visit Rabindranath Tagore’s Gitanjali (home at Rinchenpong). People visiting Sribadam during the month of January can visit Jortehang Maghay Mela which is held for 2 weeks. 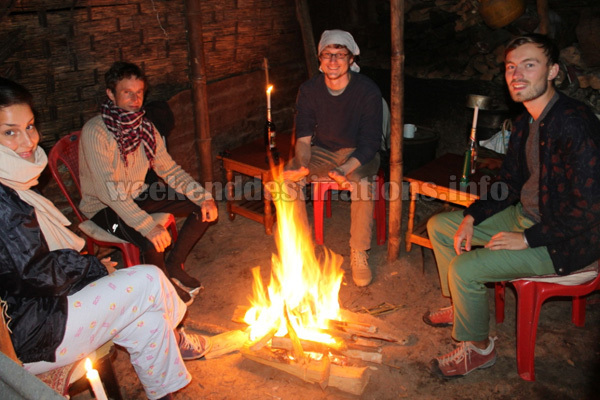 People interested in adventure sports can visit Chakhung and enjoy Paragliding from Chakung till Jorethang. You can also visit Chakung garden and have a walk on top of hill with front view of Namchi Jortehang Darjeeling and the snowy Himalayas. 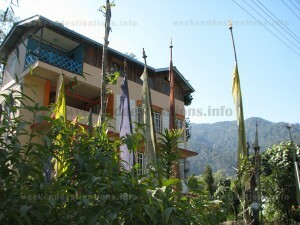 Rinchenpong monastery is also a famous sightseeing destination to visit from here. You can even go to Darjeeling which is around 2.30 hours from Sribadam. Things to do at Sribadam: You can visit the monastery and meditate there as the monastery is known for its meditation center and if required you can also get healed from any kind of the sickness from this monastery. If you want to trek there is a route to the famous Varsey Rhododendron Sanctuary. During December one can enjoy mask dance or Cham dance at Nyingmapa Palyul Dechen Gaweiling. Mountain cycling in the forest areas as well as in the village areas can be enjoyed. Old Traditional Bhutia, Subba houses can be visited. The Sribadam ground is actually a valley making it favourable for kite fliers, so people can enjoy kite flying. Trout fishing at the two rivers in Sribadam can keep anglers busy. You can even enjoy the traditional Bhutia, Limbu (Chaprung), Nepali, Lepcha, Tamu dances and local instrumental tunes. The forests of Sribadam are well known for bird watching too. Sunrise over the mountains can be seen. 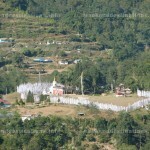 The Old Lenchay monastery can be visited, which is a part of Pemayantse and Enchey monastery. How To Reach Sribadam: From New Jalpaiguri / Siliguri you can reach Sribadam through two routes. One is via Darjeeling – Jorethang – Soreng; the other one via Melli – Jorethang – Soreng . Hired cars are available from NJP to Jorethang and from Jorethang to Sribadam. Best time to visit Sri Badam: Sribadam can be visited any time of the year. You can even visit the place during rainy seasons for enjoying the trout fishing and also for the Meditation which takes place during the monsoon season for 2 weeks. However, if you want views of the mountains then the best time is from the month of October till mid May as the skies are clear. Moreover, guests interested in Cham dance and the Phurpa Tordo Puja which last for 2 weeks must visit the place during December. Food and Lodging at Sribadam: There is only one guest house at Sribadam. This guest house contains of one single room and 2 double bedrooms and 1 triple bedroom with all standard facilities like television, hot water, attached bathrooms and even internet connections. Both non-veg and veg food are available which are all organic and produced in the guest house’s own farm. Meats, eggs, milk and local drinks are available at the Sribadam guest house.